Deterministic wavelength tunability is a key advantage of monolithic DBR lasers. Applications requiring distributed Bragg reflector (DBR) lasers are becoming more and more demanding in terms of maximum peak power and wavelength agility. The narrow bandwidth of the DBR laser diode enables extremely high resolution scanning for atomic spectroscopy, Raman spectroscopy, and pumping specific transitions for such applications as diode pumped alkali lasers. Spectroscopic analysis requires a wavelength scan across the spectral feature to resolve it. Furthermore, by repetitively scanning across the feature, an error signal can be generated that allows locking of the laser output to a specific transition. This type of wavelength agility in laser diode tuning is not possible with competing technologies, such as hybridized volume Bragg grating lasers. Furthermore, the monolithic nature of the DBR laser diode offers versatility and robustness for tunable diode laser absorption spectroscopy (TDLAS) unmatched by any external cavity laser. The wavelength tuning requirements of DBR lasers often vary from one application to another. Therefore, proper understanding of the interplay between the DBR section and the gain section is a requirement to meet device specifications imposed by the different applications. DBR laser diode tuning is accomplished by either change of injection current into the gain section (DBR current tuning), or through change in temperature of the entire device by altering the heatsink temperature (DBR temperature tuning). The change of the refractive index with temperature is the dominant tuning mechanism. DBR current tuning by changes in carrier density have smaller effects on the lasing wavelength. Physical elongation of the laser cavity with temperature also contributes to wavelength tuning, but is a much smaller effect than the other two effects. DBR temperature tuning can be viewed as a coarse adjustment, and DBR current tuning is a fine adjustment. Figure 1. Cross sectional view of a simplified DBR laser structure. Figure 1 shows the cross-sectional view of a simplified DBR laser structure. The structure consists of a gain section of length Lg and a passive DBR section of length LDBR. When current is injected into the laser structure, the gain section will experience an increase in temperature, which is proportional to the dissipated power Pdiss and the thermal resistance RT between the junction and the heat sink. For simplicity we will assume that the heat flow is primarily in the vertical direction and the temperature of the DBR grating section is equal to the heatsink temperature and is unaffected by the injected current itself. 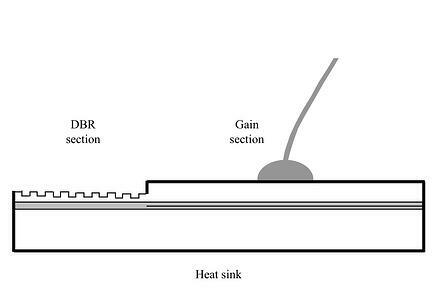 In practice a very small temperature increase in the DBR section, especially at higher injection currents is observed. where neff is the effective refractive index and aT is the temperature coefficient of the effective refractive index, which for our specific structure amounts to aT = 2.26×10‑4 K‑1. This value compares extremely well to published data assuming an Al mole fraction of the cladding regions around 30 % . The mode-hop-free current range Im is defined as the minimum required current change necessary to shift the wavelength equal to the amount of a mode spacing dl determined by the effective cavity length, i.e. where Lg is the gain section length and LDBR,eff is the effective DBR length determined by the physical length of the DBR grating and the coupling strength . The current range is inversely proportional to the gain section length and the change in the dissipated power. Since the dissipated power is roughly proportional to I2, is proportional to I. Therefore, from Eqn. 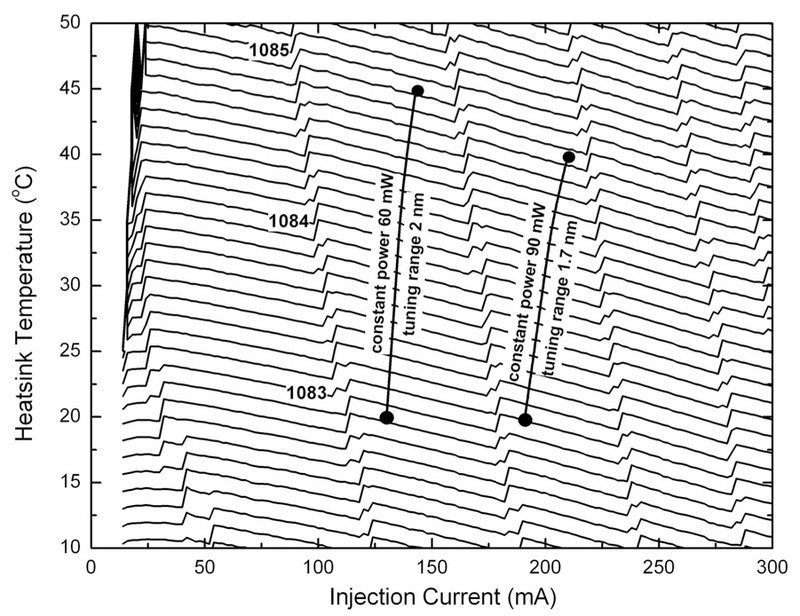 (5) the current tuning range decreases with increasing injection current as indicated in Fig. 2. Figure 2. Emission wavelength against injection current at different heatsink temperatures. The width of the continuous wavelength tuning decreases with increasing injection current (indicated by ∆1 and ∆2). Furthermore, according to Eqn. 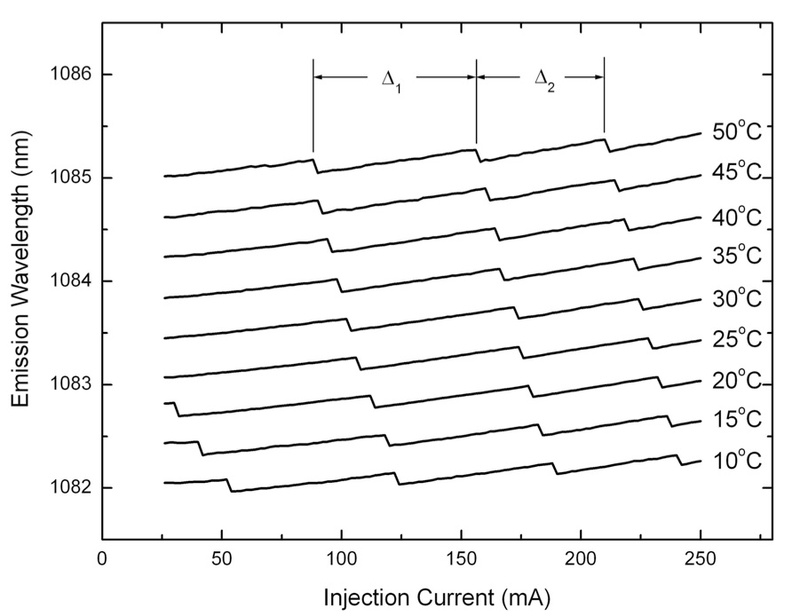 (3) the wavelength change is linear in injection current, which again can be seen in Fig. 2 at different temperatures. Figure 2 shows that for a fixed temperature the DBR laser emits in a single spectral mode with several wavelength discontinuities, with the distance between them decreasing with increasing injection current. These wavelength discontinuities, known as mode hops, are associated with an abrupt wavelength change, which correspond to the value for the longitudinal mode spacing. In general, the mode closest to the DBR peak reflectivity has the lowest modal loss and hence becomes the lasing mode. As the injection current and therefore the temperature increases, the modes shift to longer wavelengths, but at a much faster rate than the reflectivity spectrum. As the lasing mode moves away from the DBR peak reflectivity, there comes a point where the adjacent mode has a higher reflectivity. At this point the wavelength suddenly changes to a different mode, resulting in a decrease of the emission wavelength. This is called a mode hop, and it is the mechanism by which the DBR laser stays within its operating wavelength range. Figure 3. 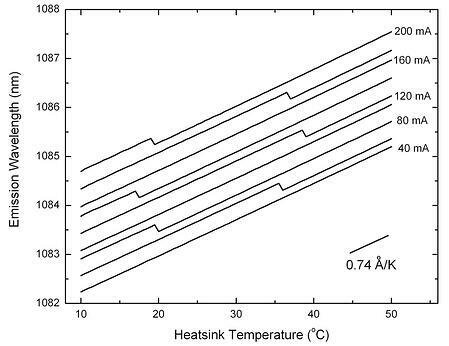 Emission wavelength against heatsink temperature at different injection currents. The individual curves are offset for clarity by 0.3 nm in the vertical direction. which can be immediately justified by looking at the temperature tuning ranges in Fig. 3. Using the two expressions for the mode-hop-free current and temperature range we can compare the effectiveness of the mode-hop-free wavelength tuning with either current or temperature, i.e. In general, the change in the dissipated power is much larger with current than with temperature, i.e. (in units of Ampere and Kelvin), which leads to a larger mode-hop-free tuning range by changing the temperature than by changing the injection current. For typical test devices in this work, we measured DIm @ 0.05 A and DTm @ 75°K, which results in a ratio of 1 : 1500. Note the exact values may vary with the specific operation conditions. Figure 4. Contour plot of the emission wavelength against injection current and heatsink temperature. The two solid lines indicate a mode-hop-free constant power operation with a tuning range of 2 and 1.7 nm, at an output power of 60 and 90 mW, respectively. Figure 4 shows a contour plot of the emission wavelength as function of the injection current and heatsink temperature. It can be clearly seen that the largest mode-hop-free tuning can be achieved with temperature. For applications requiring a constant output power, a mode-hop-free temperature tuning range of over 2 nm can easily be achieved (as indicated by the two bold solid lines at two different power levels in Fig. 4). In contrast, the wavelength shift with current amounts to less than 0.15 nm corresponding to a change in injection current of roughly 50 mA. In summary, temperature acts as a coarse laser diode tuning parameter, and current acts as a fine laser diode tuning parameter. For applications requiring a large mode-hop-free wavelength tuning range the DBR laser is best operated at a fixed injection current value and the heatsink temperature should be used to tune the wavelength. To conclude, we have demonstrated the mechanism of wavelength tuning in DBR laser diodes. We distinguished between a thermal and a current tuning mechanism. The thermal tuning is constant and amounts to 0.074 nm/K and is independent on the gain section length and operating optical power. In general, mode hop free tuning can easily be achieved over several tens of degrees. In contrast, current tuning is associated with repeated mode jumps separated in wavelength by the mode spacing, whereas the latter is determined by the gain section length and the effective length of the DBR grating. Between mode jumps the wavelength shifts quasi linearly with an average amount ranging between 1.2 nm/A and 5.2 nm/A, depending on the operation conditions and gain section length. M. Prevedelli, P. Cancio, G. Giusfredi, E.S. Pavone, M. Inguscio, “Frequency control of DBR diode lasers at 1.08 micrometer and precision spectroscopy of helium”, Optics Communications 125, pp. 231-236, 1996. S. Kraft, A. Deninger, C. Trück, J. Fortagh, F. Lison, and C. Zimmermann, “Rubidium spectroscopy at 778-780 nm with a distributed feedback laser diode”, Laser Phys. Lett. 2(2), pp. 71-76, 2005. J. Talghader and J.S. Smith, “Thermal dependence of the refractive index of GaAs and AlAs measured using semiconductor multilayer optical cavities”, Appl. Phys. Lett., 66(3), pp. 335-337, 1995. H. H. Yee, “Novel self-consistent method for determining optical coupling coefficients and grating losses of distributed Bragg reflector lasers”, Opt. Eng. 41(5), pp. 1077-1083, 2002. L.A. Coldren and S.W. Corzine, Diode Lasers and Photonic Integrated Circuits. New York: Wiley, 1995. O.J.F. Martin, G.-L. Bona, and P. Wolf, “Thermal behavior of visible AlGaInP-GaInP ridge laser diodes”, IEEE J. Quant. Electron., 28(11), pp. 2582-2588, 1992.